The eye's in this image are from a real photograph of Saint Germain. The purple fire around the outer edges represents my interpretation of String Theory, in which matter is composed of stringy strands of energy. This painting makes my head swim for days when I have spent a few hours working on it, and it has a remarkable cleansing effect, try clearing you thoughts and meditating with your eyes gently focuses on the center and you will find that it has a very very strong cleansing effect! The violet flame (also called the violet fire) is a unique spiritual energy that can help you in all areas of your life. It can heal emotional and physical problems, improve your relationships, help you to grow spiritually, or just make life easier. The flame is the essence of a unique spiritual light. Mystics of all ages have glimpsed a "spiritual spectrum" behind the physical spectrum. Radiant colors, more pure and rare than those found on earth, emanate from a brilliant, "inner" divine light. Just as a ray of sunlight passing through a prism refracts into seven colors, spiritual light splits into seven colors, or "rays" - each of which has specific divine qualities. The violet flame comes forth from the violet ray, which has the qualities of mercy, forgiveness, freedom and transmutation. The color violet has long been associated with spirituality. Having the highest frequency in the visible spectrum, violet is at the point of transition to the next octave of light. To the ancients, this transcendental color was a spiritual rather than a physical phenomenon. Saints and adepts throughout the ages have known how to use the violet flame, but it was only released to the public earlier this century by an Ascended Master called Saint Germain. Ascended Masters are enlightened spiritual beings who once walked the earth like you and me. They balanced their karma (paid their debts to life) and fulfilled their reason for being. They then ascended, or reunited with God. You probably already know the names of a few Ascended Masters - Saint Germain, Jesus Christ, Gautama Buddha and Krishna. Ever wish there was a way you could wipe out your past mistakes? While you can't go back in time, the violet flame has the power to erase, or transmute the cause, the effect, and even the memory of our past mistakes. Transmutation means to change - to alter in form, appearance or nature. The violet flame changes negative energy into positive energy, darkness into light, "fate" into opportunity. The flame also erases the resultant "bad karma" of our mistakes. Our past actions - both good and bad - do come back to us. This is the law of karma. This impersonal cosmic law decrees that whatever we do comes full circle to our doorstep for resolution; simply, what goes around comes around. In general, most people must pay their debt to life, or "balance" their karma, by selflessly reaching out and helping others, by working through misfortunes that come their way, or by passing through diseases or other forms of personal suffering. But it need not be so with the violet flame! The violet flame is able to transmute or mitigate our negative karma before it comes back to us. On the physical level, the violet flame can help heal our bodies by removing the karma that makes us vulnerable to illness and disease. But the real cause of disease is often rooted in our mental, emotional and spiritual states. Today, we are discovering more and more about how our thoughts and emotions can affect our health. Research has shown that hatred and other negative thoughts and feelings actually create excess amounts of acid in the body that it cannot assimilate. These negative thoughts and feelings often originate in emotional and psychological problems, which the violet flame can help to resolve. The scars of old hurts and painful memories may be healed and dissolved when the healing balm of the violet flame is applied. The violet flame works by changing "vibrations". In physics, vibration is the speed of oscillation - the speed at which something moves back and forth. On the atomic level, vibration can be understood to be the speed at which electrons orbit around the nucleus of the atom. The violet flame works by changing vibrations on this level. Atoms are mostly empty space. The empty space between the nucleus and the electrons is where negative energy and karma can become stuck. When the atoms in our bodies and auras become clogged with this negativity, the electrons whirl slower and slower, and we begin to resonate more with negativity, and less with light - we have a lower vibration, and become less spiritual. The violet flame transmutes this negative energy. It does not simply surround and remove the energy, but transforms it into light. Because there is less density within the atom, the electrons whirl faster and faster, thereby raising your vibration. When you have a higher vibration, there is more spiritual energy in your body. Acupuncturists and yogis know that optimum health comes when this spiritual energy flows freely throughout the body. The violet flame frees up this energy and re-establishes harmony and equilibrium, propelling you into a more spiritual state of being. The violet flame is a tool of self-transformation. Physical experiments in alchemy whereby base metals are transformed into gold are symbolic of what the violet flame does. In medieval times, alchemists attempted to transmute base metals into gold, using heat to separate the "subtle" from the "gross". While there have always been alchemists who sought to create wealth by transmuting base metals, this process of transmutation is symbolic of a higher and more noble alchemy - the alchemy of self-transformation. Alchemists of the Spirit did not seek physical wealth, but spiritual wealth. They sought to transform themselves into more spiritual beings, by becoming more loving, wise and compassionate. The violet flame has the capacity to bring about this transformation by transmuting negative elements within ourselves. It has the unique ability to transform fear into courage, anxiety into peace and hatred into love. Alchemists of all ages have sought the mystical philosophers' stone. Early alchemists pored over minutely ciphered texts in search of this stone. For them, it was worth a lifetime to decode the mystery of this "stone" which symbolized the transmutation of the lower animal nature into the highest and divine. The coveted philosophers' stone - "the stone which is no stone" - was not physical, but spiritual, and created out of fire. Some alchemists did discover the secret of the violet flame. According to Neoplatonist alchemists, the philosophers' stone was a self-transforming fire that would lead their souls upward, by drawing up to the Spirit all qualities which dragged downward and opposed the spiritual essences. In the process, the "hard and refractory materials" in their bodies would be transmuted into a rare and more luminous material. In this sacred experiment, they said the alchemist would become "like the gods", pursuing "the gold of the wise and not the vulgar metal". Transmutation, then, was not just a process which turned base metals into gold, but a spiritual process which raised the soul into a state of unity with the Divine. In these times of financial insecurity, stress and worry, the Violet Flame can insure your prosperity and abundance. There also are mental conditions and thoughts that are necessary for beneficial results. The mental and emotional attitude to sustain is one of love and trust and faith that you are fine - that everything is going to work out well for you. The emotion and thought of fear must be completely avoided! Do not listen or accept the media based view of reality. That is only an illusion meant to create fear. Know within your heart and entire Being that your Divine Source is where your abundance and prosperity comes from - not from a paycheck, a certain job, or even your own company. Your fortune may come through one of those avenues, but to rely on those 3rd dimensional answers, or to grasp at questionable potentials such as pyramid schemes or buying lots of lottery tickets, is to deny the fact that your Source can bring prosperity and abundance to you in unlimited amounts of ways. By focusing on abundance, prosperity, well-being, success in your life and circumstances without putting conditions on how that must be done, will multiply the avenues and channels for prosperity to reach you. In other words, if in your mind, the only way that you can survive this financial crisis is to be working for a specific company and receiving x amount of dollars every Friday afternoon, limits the opportunities for prosperity to reach you. When we state that I want to keep my job, or my tenant must stay in my building and pay me the rent, or put conditions on our prayers, those conditions and expectations limit how we may receive things. Having no conditions, being open and willing to receive prosperity and abundance in any Divine way opens you up to unlimited avenues. Simply state to your Divine Source what you want, affirm that it is already there and let go of the attachment of how Spirit must bring it to you. Remember, things are really different now than they were even 1 year ago. Our thoughts and our attitude and prayers are so much more effective now in instant and deep manifestation. Having the boldness and the desires to state our desires and bring them forth is so important. Really dream big, because we are creating our reality more than we ever have, in a more complete way. So many people might say, "Oh my God, I don't have a job and what am I going to do. . . please God, If only I can pay the rent." So that's what they're going to get. They're only going to get to pay the rent. The people that have the faith and imagination and ability to really dream and say, "Okay, let's create a whole new life of abundance for me", and are open to Spirit showing them hundreds of ways of making money will create a whole new life for themselves. Be open to a total transformation of who you are and how to relate to the world and what you can create. Envision big, dream big and you are going to get that. The entire world is going through a major shift right now, financially. Things are very chaotic. The greed and uneven exchange for work and services and products, must be rearranged for the Golden Age to be materialized. Do you think that in the Golden Age everything is going to be exactly the way things are now? The Golden Age will have much more equality, much more of an evenness of exchange. You will not see one or two people at the head of a company making an obscene amount of money while the masses, which are actually producing and/or selling the products or creating the services, are paid a very meager wage. The Golden Age recognizes the worth and the Divinity of each and every person, not just a few that have chosen themselves to be the wealthy ones. Anytime there is a change, chaos happens before the new order takes effect. This is a wonderful time of opportunity! We get to create the new ways of life. Using the Violet Flame for financial abundance and prosperity will hurry the changes for yourself and the world. We all must stay focused on a vision of Peace, Prosperity and Abundance for All . . . and hang on during the transition. It should take no more than 4 years for the totality of change to take place. There are many Lightworkers on the planet now who have had previous incarnations on this planet and other planets where they've taken vows of poverty. There was a longtime, erroneous belief that to be a truly spiritually devoted person, one must be poor with no positions or luxuries in life. This is not true. It never was and it is especially not true now. However, because of this condition and previous contracts, many Lightworkers carry this thought subconsciously, in their DNA, or in a parallel universe. You might still be experiencing a lifetime like that. Old contracts, thoughts and beliefs that money is evil - you can't be spiritual if you have money - or if you charge for your work your talents will be taken away, and on and on. Those things aren't really true. It's exactly the opposite. You need to have people honor your work. Being that past, present and future exist simultaneously, if you have taken that vow in the past, it is still here in the present. When you use the Violet Flame to change your financial fortunes in this incarnation, as you ask for the Violet Flame to transmute anything and everything known and unknown to you that might prevent you from your full abundance and prosperity that is the Divine gift and birthright, you can change the past as well. 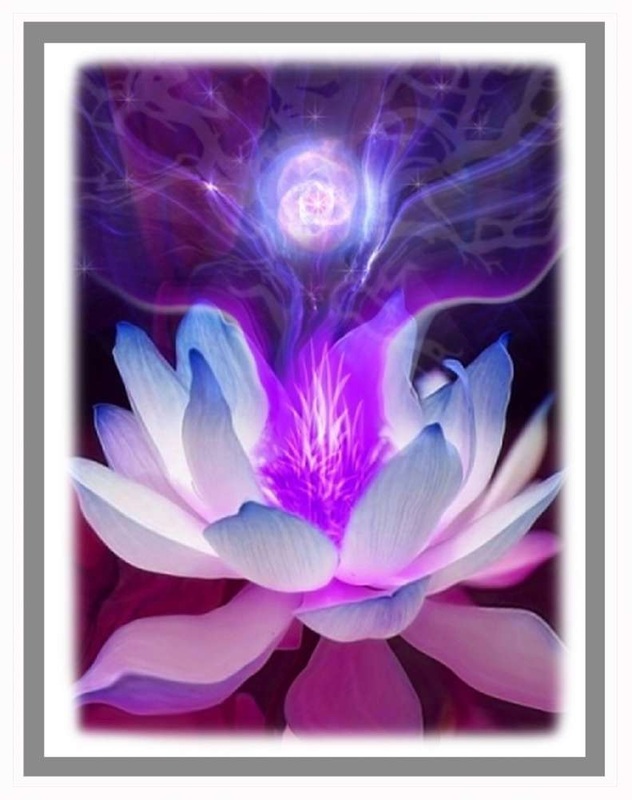 Ask the Violet Flame to turn those negative thoughts, actions and deeds into Divine abundance and prosperity. You can use that term or for a visual - ask for it to turn into the Emerald Ray of abundance, prosperity, vital health, and vital life. Money is nothing more than energy. You want as much vital prosperous energy that you can have and the color of that is a beautiful emerald green. See this green energy raining on you as if dollar bills were being thrown on you. Also ask that the negative thoughts be turned into the Golden Platinum Light and see the color of metallic gold & platinum energy. See gold and platinum coins falling upon you and surrounding you. Create the visual of the beautiful emerald green being edged with gold & platinum and see flecks of gold & platinum within that green ray. Bathe yourself in the green, gold and platinum - ask it to come into your body, just as you do with the Violet Flame, and to surround you, encompassing your mental, emotional, physical and spiritual body. Have the focus and intention of vibrant health and perfect prosperity and abundance to surround you in all that you do in this dimension, as well as all other dimensions. Step 1. Bring the Violet Flame into your body. Ask your Higher Self, a Master, Guide or Angel to assist you to do so, or just ask the Flame to "be made manifest," whichever is most comfortable. It is helpful to visualize (doesn't matter if you can or cannot actually see it) or pretend that there is a ball of violet fire above your head. Then ask that ball of fire to come into your body and fill every speck of your entire body. Step 2. Spin the flame in and around your body. Keep the Flame inside your body while asking it to also come out through your heart chakra and spin around or encircle the outside of your body so that it's encompassing your emotional, mental and spiritual bodies. Step 3. Ask the Violet Flame to transmute all past, present and future contracts of poverty, thoughts emotions, belief systems and any erroneous thoughts, actions or deeds that limit financial prosperity and abundance on any dimension and any level, in all time and space, past, present and future, known and unknown to me. Step 4. Change negativity into Divine Light and fill your body. "Holes" are created in your aura where the dense energy and blocks were consumed by using the Violet Flame. It is very important to fill those spaces up with love, prosperity, abundance, peace and happiness. You can also ask for specific colors, which are pure energy. Green is health and abundance. The Golden Platinum Light of the Christ Consciousness is always an excellent choice to invoke. The following is an example of the 4-step Alchemical Violet Flame Meditation, which will concentrate on Prosperity and Abundance. Please individualize the Invocation using words from your heart and say them with great feeling and intention. Saying the words out loud is best because the power and vibration of the spoken word has energy, which helps create the maximum results of the Violet Flame. Transmute all fear and worry concerning abundance and prosperity, feelings about lack and separation from Divine Source, all past, present and future contracts of poverty, thoughts, emotions, belief systems, and any actions or deeds that limit the full abundance and prosperity that is my Divine gift and birthright, on any dimension and any level, in all time and space, past, present and future, known and unknown to me. Beloved Violet Flame turn all that has been transmuted into the Emerald Ray of Abundance and Prosperity and The Golden Platinum Light of God, the Christ Consciousness, The Light of God that never fails. Send this Emerald and Golden Platinum Light to me now, filling and surrounding my entire body with its Divine Radiance, filling me with Divine Prosperity and Abundance while raising my vibration and frequency to the highest level possible for me at this time.